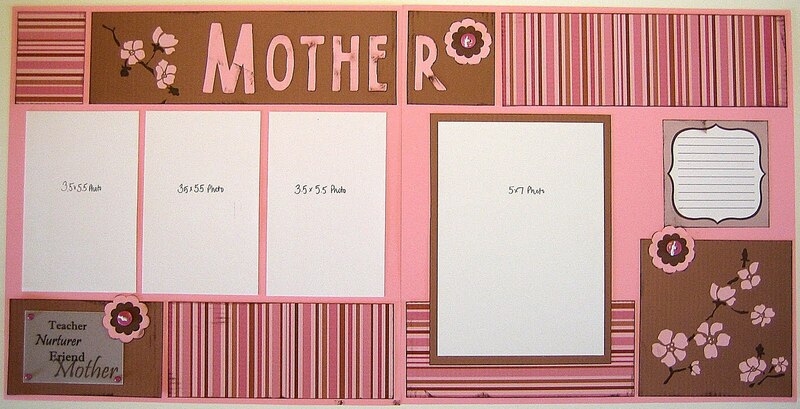 The new "Mother" Page Pak features sweet & feminine pink balanced by lots of chocolate brown - the perfect combination! As always, our affordable Page Paks feature coordinating products from quality manufacturers. All products are acid free and photo safe. Page Paks contain enough solid & patterned papers and embellishments to complete at least two 12 x 12 layouts—usually with plenty leftover! Use the products to complete the sample layout shown, or design your own. 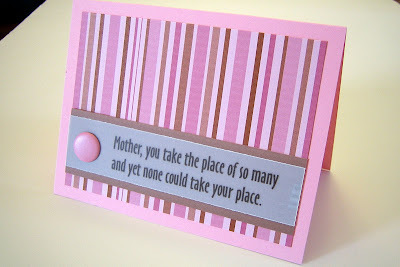 After creating this layout, there were enough leftovers to create a matching card for mom. I just used some pink cardstock from my personal stash for the base and added one large pink brad (not inluded in Pak). I placed some of the leftover striped paper as a background and layerd one of the vellum sayings onto a scrap of the brown cardstock. Fast and cute! And I actually have enough to make one for mom and one for my MIL!